Avvie had never had a pet come into her room before – at least not a pet that wasn’t one of her siblings. She never had friends over for a reason, a reason she wouldn’t tell anyone. But her owner had been talking with Kim’s, and somewhere in the conversation she’d invited Kim over to their house. Avvie had had about ten minutes to hide everything that might give her secret away. She’d suggested they’d stay in the giant living room to play cards, which had worked at first until Avvie’s owner suggested they go up to her room. It was going to be doomsday for her reputation, Avvie could tell. “Hey, Avv, you never told me you had a petpet!” Kim exclaimed. When Avvie whipped around, she saw the blue Cybunny petting a brown Kadoatie. Prince was enjoying it immensely. “What’s his name?” Kim asked, scratching the little petpet behind the ears. “Buzz off, Lisbond,” Avvie snapped at her younger brother. “My owner,” Avvie answered, which was true. She turned her attention back to her brother, the Royalboy Zafara. He was dressed in his full outfit, with his purple hat, cape, shirt, and shoes that went together perfectly with his silky blue fur-and-scales combination. “SIR Lisbond. Sir Lisbond Xavier the First,” Lisbond corrected. “Hey, so Avvie, are you painted royal?” Kim asked. This question made Avvie sweat. What would she say? Would she lie? Lying to protect her reputation wasn’t something that would make her proud, she knew. But she had to do it. No one could know that the biggest tomboy at Neoschool was a royal Eyrie. “No, I was created before my owner’s royal craze,” Avvie said calmly, coolly. “Oh.” Kim said. She wandered over to the wardrobes, where Avvie had been trying to keep her away from. There was no stopping her now. Avvie’s heart sank as the Cybunny pulled open the elegant doors. Kim gasped at the sight of the dress. It was green velvet, the dress that could be worn only by a Royalgirl Eyrie. Then she saw the necklace sitting on the shelf, the elegant bejeweled hairbrush. Kim was in shock. Then the shock turned into hysterical laughter. It hurt Avvie, right down to the heart. Her secret had been found out. Her reputation as the least-girly pet in Rainbow Pool Middle Neoschool was gone, destroyed, down the drain. “Y-You’re meaning to tell me,” Kim said, sides aching with laughter. “You’re a royal pet? I mean, I asked you just a minute ago, and you said no, but you really...” The Cybunny snorted. She was shaking too hard to continue talking. “OUT!! !” Avvie screamed at the top of her lungs. Kim jumped five feet in the air and scurried out of the room as fast as her legs could carry her. Avvie didn’t go down for dinner that night. No matter how many times her owner called her, she didn’t budge from where she lay, crying, on her fancy bed. The only time she got up was to retrieve an item that lay inside a drawer in her nightstand: the Royalgirl Eyrie tiara, her least favorite item. Avvie clutched it so hard it nearly broke. She flopped down on her bed again, sobbing. At last, almost an hour later, Avvie heard the door creak open and her owner, Lilly, came in. “I wish she was,” Avvie muttered, her voice muffled because it was pressed into a pillow. “Now, Adverdailia, that isn’t a nice way to talk about our friends,” Lilly scolded, still using her soft tone. That was the truth. Avvie barely knew Kim at all. Their owners knew each other, and that was all they had in common. “Adverdailia, you stop talking like that right NOW,” Lilly said, that soft tone disappearing. She burst out the front door. She realized she was still clutching tightly the royal tiara. Her arm shook as she pressed on it hard. Anger welling up inside her, she flung the tiara at her castle-like Neohome. She didn’t want to see if it had broken or not, she just fled. After running and running to who-knows-where, Avvie stopped. Where was she going to spend the night? The first thought that came into her head was ‘Lynn’. Lynn was her best friend, a green Xweetok. She was a real friend, one who would never give away any secrets. Despite this, Avvie still hadn’t told Lynn that she was a royal Eyrie. Lynn was also a huge tomboy, like Avvie. This was made obvious by the ever-present brown cloak whose hood she wore down to just above her glistening eyes. It gave Lynn a mysterious, solitary look, which was contradicted by her amiable laugh and good sense of humor. In her eyes, though, you could see a secretive shine, like one who has locked many things away in the back of their mind. In this way, Avvie and Lynn were much alike, which made them good friends. So Avvie ran there, two neighborhoods over, to Lynn’s house. She knocked on the door. Avvie could hear Lynn’s Darigan Camariller, Fetch, flapping its wings in the background. Lynn opened the door and was taken aback by the tears on her friend’s face. That was just the friend Lynn was, being able to tell when Avvie just didn’t want to talk about something. Lynn let the Eyrie have her bed, and Lynn slept in her sleeping bag on the floor. Too tired to argue, Avvie fell asleep right away. The next morning, Lynn woke up her friend for Neoschool. “My backpack is at home...” Avvie mumbled sleepily. “It’s alright, Avvie, we’ll stop by your house on the way to Neoschool and I’ll get them for you, ok?” Lynn said softly. Wearily, the purple Eyrie nodded and the two, eating their breakfast of boiled eggs as they went, headed off to Avvie’s house. Lynn knocked on their elegant door. Avvie lingered behind, on the sidewalk, turning her face away so that hopefully Lilly wouldn’t recognize her. Milkain answered the door, and kindly Lynn asked for Avvie’s backpack. Without argument, the Zafara brought the requested item, and Lynn and Avvie were on the way to Neoschool. But Avvie tried to remain strong. It was easier since Lynn was at her side. Avvie knew nobody else would do that for her, and she knew it was hard for Lynn to stay with her. The Xweetok got taunted too – “Hey look, it’s her majesty’s serving girl!” but she stayed with her friend through it all, watching the world from under that brown hood. The teasing did not stop after that first day. It went on for weeks without rest. Nobody seemed to remember Avvie the tomboy, the one who did all the crazy stunts, the one everyone admired. Instead, ‘the Princess of Rainbow Pool Neoschool’ had replaced her. And still Lynn did not abandon her; leave her to take the mocking by herself. Silently she walked with Avvie down the hallways. One day, though, coming back from Neoschool, a band of Neopets followed her, chanting, “Make way for the princess! Bow down, all her royal subjects!” This wasn’t the first time it’d happened. Nearly every day for five days a week these Neopians followed her home, mocking her until she was in the safety of her house. Today, though, it was all too much, and Avvie, wiping tears away, ran. She collapsed on her bed, sobbing like she had the day Kim had revealed her true color. This made the crowd of Neopets laugh even louder. Avvie, hysterical with sorrow, knew this would be the topic of the next day’s taunting. She could see it now: ‘Princess Adverdailia the crybaby’. The next day was as bad as she’d thought, and then some. All the Neopians that had seen her cry were spreading the word. It caught on like the idea of Usukis, and soon it was the talk of the school. In the classrooms, nothing was said for fear of punishment by the teachers. Then, at lunch, the main event began. “That doesn’t even fit!” Lynn pointed out, exasperated. She’d been defending Avvie against the enemies all day, and she was beginning to get tired. Avvie, embarrassed, picked at the mystery lunch on her plastic tray. Lynn remained cool. She said nothing. Lynn remained silent, locking eyes with the Mynci that offered her a chance to keep her reputation. Lynn made a fast, fluid motion and yanked back her brown hood. Avvie looked over at her and gasped. The lunch room with its tall ceiling that made all voices echo suddenly got quiet. Two bug-like antennas had sprung from Lynn’s head as she pulled the hood back. Her fur, which had seemed a dark green and brown under the shadows of her long cloak, was now a pale green and tan in the light. Delicate wings stuck out from her back. They flapped gently in the air as Lynn stood there, unmoving and steadfast, making a slight “whoosh” sound. “That’s why,” Lynn said seriously. Surprisingly, the lunchroom did not break out into laughter. It remained calm as all stared in awe at Lynn, including Avvie. 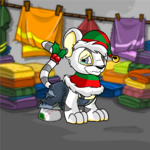 A Faerie Xweetok? Tears welled up in the Eyrie’s eyes. “Oh Lynn,” she thought. Lynn turned and smiled at Avvie. “I’ve got your back,” she said, and Avvie believed her. The next day, the Neoschool’s paper was out. The front page issued a picture of Lynn and Avvie in the lunch room from the previous day, Lynn’s wings flapping behind her. The headline was, ‘The Real Color’. And nobody dared to mock the Xweetok. The way she remained tough and funny like she usually was, it was like she hadn’t changed at all. In fact, everybody got so used to Lynn’s real color that not many remembered her ever being anything else. The new kids at Neoschool never knew any different. All that changed in the way the Faerie Xweetok was treated was the occasional compliment on her ‘gorgeous wings’. And of course, things changed for Avvie, too. All the taunting and teasing went away completely. She became that “really pretty Eyrie in room 130”. And like Lynn, she acted the same as everyone else. One afternoon, Avvie came home feeling pretty good. 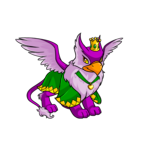 It was one of the first days she hadn’t been mocked for her color, when pets began to accept her being a Royalgirl Eyrie. She beamed as she walked through the door and for once didn’t scold Lisbond for leaving his action figures. But then she saw Lilly, her owner, in the grand kitchen. She looked regretful, sad even, as she asked to talk to Avvie in private. “Sure, Lil, what’s up?” Avvie asked, cheerful but a little confused. She followed Lilly into the living room. Lilly spoke in a low tone. From her purse Lilly pulled out an item that brought out a gasp from her Eyrie. “It’s a... Shadow Paint Brush?” Avvie looked at her owner with shining eyes. “Avvie, that’s wonderful!” Lilly said. “Oh, and Mom?” Avvie said, smiling. “Call me Adverdailia,” the Eyrie said, and her owner grinned.